during the late 1960s and early 1970s. and form his own band consisting of other Birmingham area musicians. in the early 1960s along with drummer Jim Capaldi (see The Hellions). Dave worked as a roadie for the Spencer Davis Group. had been in Sounds Of Blue who later became Chicken Shack. on Aston High Street in Birmingham and it was there that the idea for Traffic was formed. in order to write and rehearse new material. Trevor Burton (of The Move) amongst many others. who intended to promote the band to help the launch of Island Records as a major act label. and Traffic’s first single Paper Sun was released in the summer of 1967.
and featured an Indian sitar played prominently by Dave Mason. the country at the time. The next Traffic single was even more adventurous and was composed and sung by Dave Mason. and the recording featured his innovative use of the Mellotron. The Pink Floyd’s See Emily Play. with the song again making the top ten). by Steve Winwood’s previous band The Spencer Davis Group. something quite unusual in Britain for a pop group in those days and an indication of things to come. the more jazz-influenced songs of the other group members. supposedly to begin a solo career, only to rejoin the band in May of 1968.
by other artists but Mason left again in October of 1968 and a few months later, the group activities ceased. made up of leftover recordings, single B-sides, and some assorted live material. 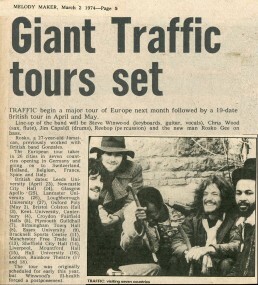 A compilation entitled The Best Of Traffic was also released. formed the much publicized and short lived “supergroup” Blind Faith. Trevor Burton (see The Move) and Denny Laine (see The Moody Blues). but it was short-lived and had split up by March 1969.
and was joined in the studio by Jim Capaldi and Chris Wood. was released as a group effort. The album was critically acclaimed and became a big seller. (originally recorded by Steve Winwood’s old band The Spencer Davis Group) made the charts. Steve Winwood, Jim Capaldi and Chris Wood were all concentrating on solo careers. Chris Wood died from liver disease in July of 1983 at only 39 years of age. in October of 1975 with Love Hurts. 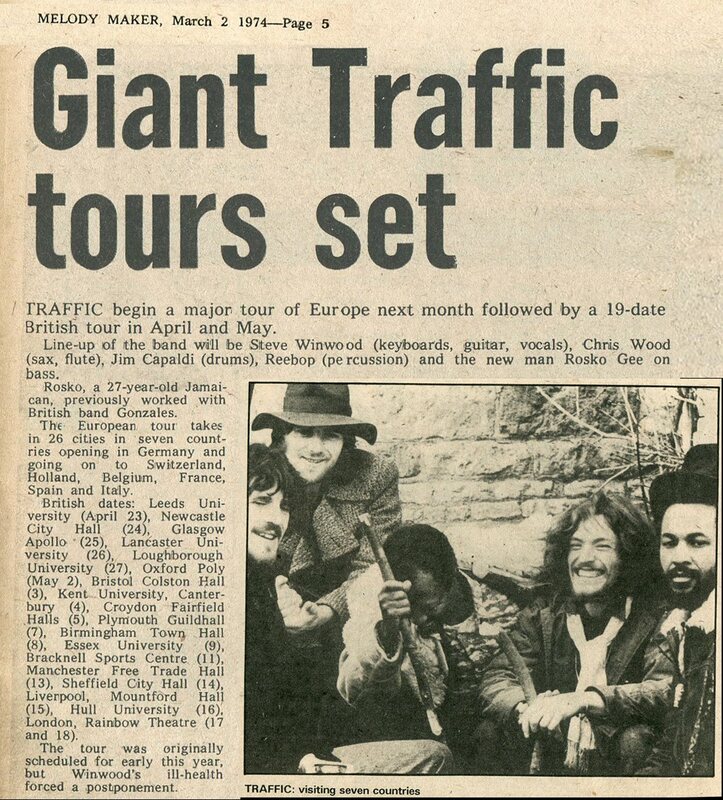 with his former bandmate Steve Winwood which included a Traffic re-union in 1994.
with the 1970s line-up of Traffic. where he is remembered mainly for his contributions as part of Traffic. throughout the 1970s and in 1981, began a predictably successful solo career. while hit singles such as Valerie and Higher Love have scored high chart placings in many countries. and perform today in between spending time at his farm in Oxfordshire.